Part of the ethos of naturism is getting back to all things natural, and eliminating unnecessary products and materials from our lives. One way we can easily do this, is by using 100% natural ingredients to clean our homes. Conventional cleaning products contain many harmful chemicals such as ammonia and formaldehyde which are not only damaging to the environment, but are also bad for humans and animals – not ideal for households with young children or pets. Plus many of the chemicals used in conventional cleaning products contain possible carcinogens, as well as chemicals which can cause allergic reactions. Wouldn’t it be better if there was a natural way to clean your home? Well there is. Here are some of our favourite cleaning techniques, and even better these will save you money as they involve ingredients that can readily be found in most homes. 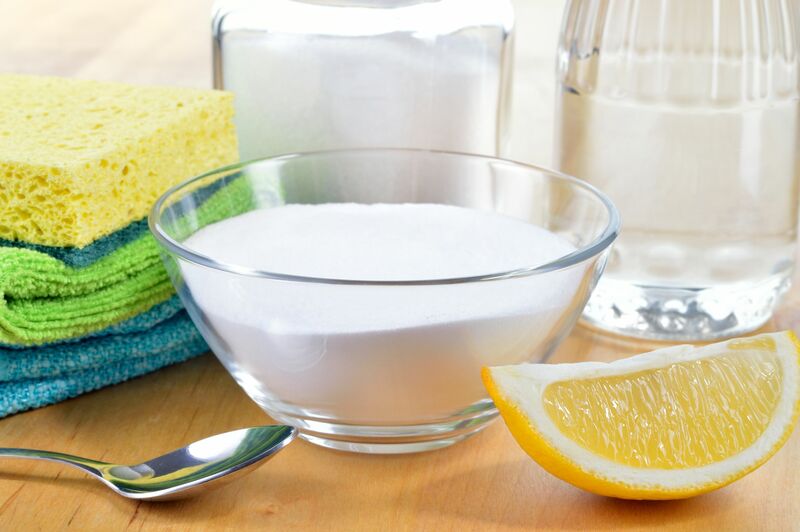 All you need is vinegar, baking soda, lemons and salt, and you can effectively clean your entire home the natural way. Combine half a cup of vinegar and a quarter cup of baking soda with two litres of water, and use this as a general purpose spray around your home. If you want a disinfectant cleaner, then add a few drops of tea tree oil. If your plughole is blocked, simply add a couple of spoonfuls of baking soda, followed by a cup of vinegar. The mixture will react and expand, forcing the blockage through the pipe. Simply rinse with hot water afterwards. Cut a lemon in half, and pour some salt on it, to create an abrasive. Simply rub around the bath tub to remove grime. Or experiment with other citrus fruits such as lime and grapefruit to create different scents. Make a paste with baking soda and water, and apply to your tiles. leave for half an hour and wipe clean. Spray the area using either vinegar or lemon juice diluted in water. If food is stuck on to your ceramic or glass hob, then all you have to do is dampen the area with water, and sprinkle on some baking soda. Leave to stand until the soda dissolves the stains, then wipe clean with a damp cloth. To remove burned on stains from your oven, mix ¾ cup of baking soda and ¼ cup of salt, with enough water to make a thick paste. spread this over the inside of your oven and leave it overnight. In the morning you should be able to just wipe clean, or use a scouring pad for any tough areas. Wipe the surface of your chopping board with a lemon to disinfect it, and to remove food smells. Use black tea to mop wooden floors, as the acid in the tannins helps remove grease and grime. You can also use vinegar or lemon juice instead. Add a cup of vinegar and a few drops of olive oil to warm water in your mop bucket, and use this to mop vinyl and laminate flooring. The vinegar evaporates as the floors dry, so you won’t be left with any unusual smell! You could even add some essential oils to give your home a nice scent, or use peppermint or tea tree oil to repel insects and spiders. Add some essential oil or scented oil to a cup of baking soda, mix well, and sprinkle over carpets, rugs and upholstery. Leave it for a few hours, or as long as you can, so the scent can permeate the fabric, before vacuuming. This can also be used on mattresses, using lavender essential oil to help you relax. For greasy stains on carpets and upholstery, sprinkle corn flour over the area to absorb and lift the stain, before vacuuming. apply a spoonful of olive oil and a spoonful of lemon juice to a slightly damp cloth. Make sure the mixture is evenly distributed all over the cloth, and simply wipe over wooden furniture. Add half a cup of vinegar to a basin of water, and use a cotton or microfiber cloth to remove stains from your windows, before using a crumpled sheet of newspaper to dry the window and buff to a streak-free shine. Add some vinegar as a natural fabric softener, during the final rinse cycle of your washing program. Fill an empty spray bottle with warm water until almost full. Add 3 tablespoons of vodka and 12 drops of essential oil. Replace the lid and shake vigorously to combine before each spray.